Home › Promotions › Free Install on Handlebar Mirrors ! Free Install on Handlebar Mirrors ! 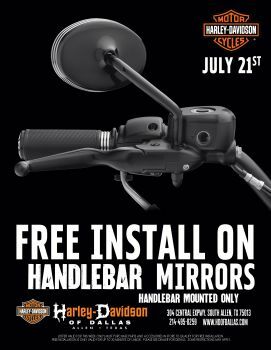 July 15th thru 21st with the purchase of Handlebar Mirrors (Mounted only) receive FREE install! Some restrictions may apply please see dealer for details.